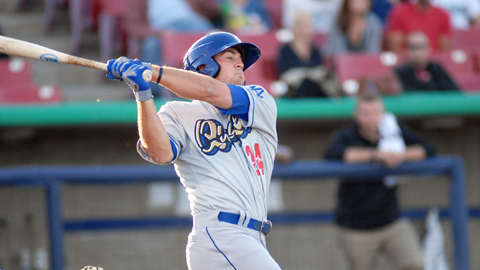 Rancho Cucamonga, CA - The Rancho Cucamonga Quakes are proud to announce that outfielder Scott Schebler has been chosen as a post-season California League All-Star, as announced today by the California League. Schebler has been incredible in the second half, helping the Quakes to contend for a playoff spot, as they currently lead the High Desert Mavericks by a half-game for the final wild card spot in the South Division. Since the All-Star break, Schebler is batting .333 with 18 of his league-leading 27 home runs and 60 of his 90 RBIs, which is currently tied for second in the league. Overall, the Cedar Rapids, Iowa native is batting .307, currently sixth in the entire circuit. Schebler, who also leads the league in total bases (265) and extra-base hits (66), is the only Quake to make this year's post-season All-Star Team. Inland Empire's Zach Borenstein has been named the league's MVP, while Stockton's Addison Russell was named the Cal League Rookie of the Year. Lancaster skipper Rodney Linares, who guided the JetHawks to last year's Cal League Title and the best record in the league this season, has been named Manager of the Year. Cal League Awards are voted upon by league Managers , Media and Radio Broadcasters. The wild card-leading Quakes open a big four-game series tonight in Lancaster, as Rancho looks for their third straight win. The game can be heard live on AM 1510 KSPA or online at rcquakes.com. The Quakes return to LoanMart Field on Tuesday, August 27th for the final home stand of the regular season. Tickets are available by calling (909) 481-5000 or online at rcquakes.com. We hope to see you very soon at LoanMart Field. Go Quakes!